Moving science forward, one small study at a time. For me, this all started around campfire at a scientific meeting so intimate that it is typically referred to rather quaintly or cryptically as the ‘Western Mycorrhiza Gathering.’ We were gathering (cryptically) in the Douglas fir forests that flank Mt Rainer, and at the evening campfire I found myself next to David Janos. 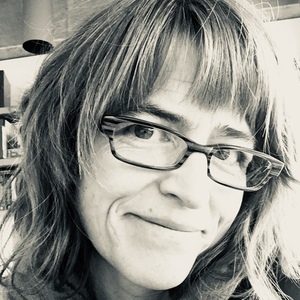 He was going on about how his excellent graduate student, Catalina Aristizábal, had finished her degree and promptly disappeared from the research scene, her time and energy consumed by the day to day demands of starting a family. Having recently re-entered academia after a six-year hiatus to care for my own children, Catalina’s story was familiar, understandable, but still lamentable. How can we retain women in the research pipeline? How can we support women (or anyone) trying to re-enter academia after the early child-rearing years are behind them? Specifically, how could I start a research program up from scratch that would contribute to the field and create meaningful research opportunities for students? As my mind drifted back to the fire, Dave was explaining: Catalina had produced one paper on arbuscular mycorrhizal (AM) fungi proliferating in leaf litter of tropical forests, but there were many unanswered questions. Arbuscular mycorrhizal (AM) fungi form symbioses with plants in which they trade mineral nutrients for photosynthates. The symbiosis likely dates back to the first land plants and today most plants form arbuscular mycorrhizae. The ability of AM fungi to access nutrients is key to the functioning of this symbiosis. At one time, researchers believed AM fungi could access nutrients bound in leaf litter and transfer them directly to host plants in a phenomenon termed ‘direct mineral cycling.’ However, subsequent research found AM fungi lack the ability to cleave organic molecules, and thus should not be able to directly cycle nutrients from leaf litter. If true, AM host plants should be at a disadvantage when nutrients are predominantly bound in organic matter. Yet AM host plants dominate tropical forests and Catalina, as others before her, had found AM fungi proliferating in the tropical litter. Could AM fungi be growing into leaf litter in other forests, such as evergreen-dominated forests where most plants did not form arbuscular mycorrhizae? This would imply the phenomenon is more widespread than previously believed and that AM fungi may somehow have indirect access to the nutrients contained in the litter. Dave, who was looking forward to his retirement, suggested my lab could look for AM fungi in leaf litter of our local forests. I mulled this over. This research would use sites close to campus and require minimal funds. Even better, the work needed to be done over the winter season (i.e. the academic year). This was a perfect fit for an undergraduate research project. Over two winters (and two sets of undergraduate students), we placed leaf litter in bags nearby Douglas-fir forests, where AM hosts are present, but are not the dominant trees. After a few months, leaf litter bags were collected, leaf surfaces were carefully cleaned, and leaves were examined for internal AM fungal colonization. In the initial, very low budget approach, we made leaf litter bags out of produce netting and bamboo skewers. Version 1 of leaf litter bags made of produce netting and bamboo skewers, October 2012. 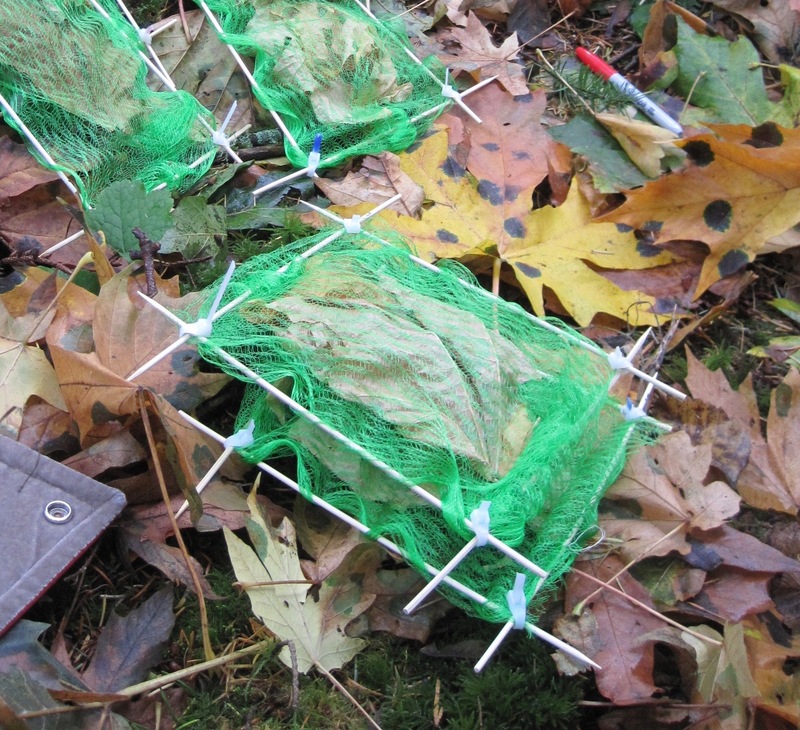 We eventually upgraded to heat-sealed squares of 30 μm nylon mesh and enough funding to deploy samples in two forests. As a favor, Ylva Lekberg at MPG Ranch extracted and amplified DNA from our leaf litter and soil samples using AM fungi-specific primers. Ultimately, we found AM fungi in leaf litter at all eight of our sites, and evidence that fungal taxa differ in their preference for litter or soil. 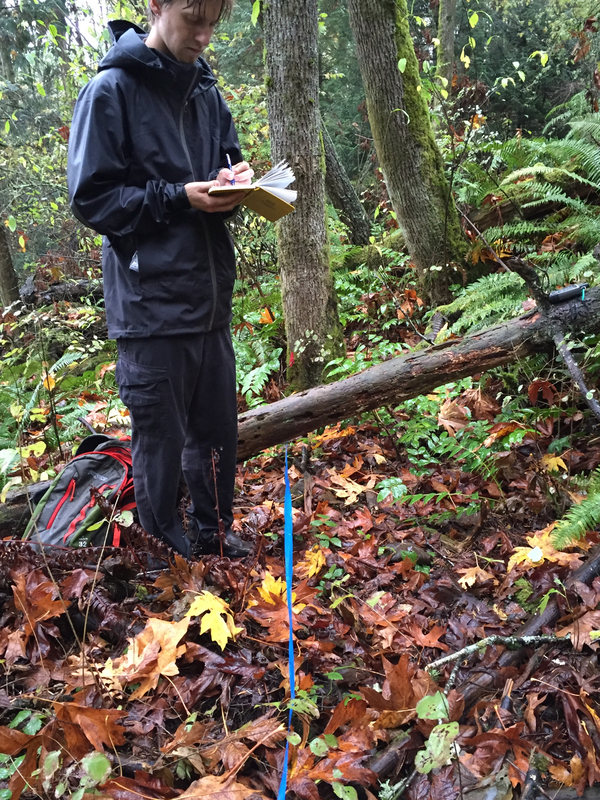 Dylan Simpson recording site details as we deploy our 30 μm nylon mesh leaf litter bags, October 2015. 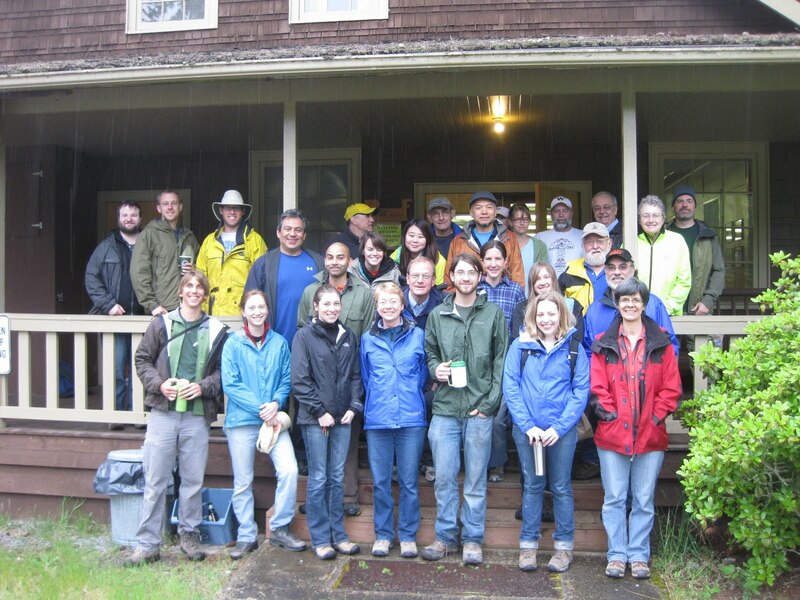 In the time it took to complete this work, two other studies documented AM fungi in leaf litter in a temperate forests on the other side of the globe, adding more evidence that this phenomenon is widespread. This raises the question, if AM fungi truly are incapable of decomposing organic matter, why are they in leaf litter? The answer may be as simple as the general truth: none of us can do it alone. AM fungi, existing as they do in complex communities of soil biota, are unlikely to ever be doing anything alone. Interactions between AM fungi and decomposers is an active and exciting area of research; AM fungi may act in a tight partnership with some decomposers, trading plant photosynthates for mineralized nutrients. If this occurs in forests, it may result in something like the ‘direct mineral hypothesis’ albeit via a different mechanism. Or, it may not. Much in the way this study was an amalgamation of various players all contributing what they could, our intent with publishing this work was to catalyze research across scales from biochemical signaling to landscape nutrient fluxes. Only by putting these pieces together will we be able to help determine if and how AM fungi may be important players in cycling nutrients from organic materials to host plants. When we work together and build on each other’s findings – no matter how small the study or the researcher – then science moves forward.